The North-East of India has 8 states - Arunachal Pradesh, Assam, Manipur, Meghalaya, Mizoram, Nagaland, Sikkim and Tripura. This part of India has boundaries with Bangladesh, Bhutan, Myanmar and Nepal. It has many different tribes, ethnic groups and cultures. It is one of the least known parts of India, since till recently, outsiders needed special permissions to visit this part of India. The total population of the North-East is about 45 million and its surface area is about the same as that of Great Britain. 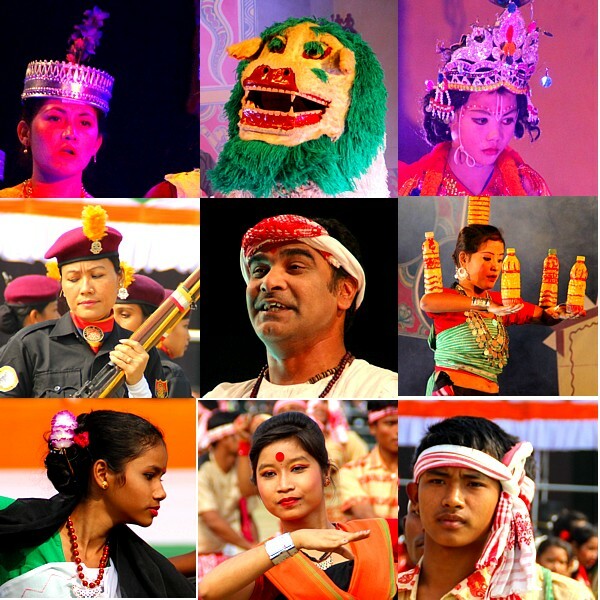 About 70% of this population lives in the state of Assam. Thus, the remaining seven states have small populations and large areas of mountains and forests, including numerous protected wild-life parks. Since 2015, foreigners do not require special permissions to visit these states (except for Arunachal Pradesh). Many of these states have been involved in armed conflicts over the past decades. Even now, occasionally new conflicts burst out. However, generally speaking, the situation is much better now and till now, there have not been any attacks on the tourists. Guwahati, the capital of Assam, is the gateway to all the 8 states of the north-east. All international airports in India have daily connecting flights to Guwahati. Recently, some of the other states (Nagaland, Tripura, Manipur) also have some direct flights, especially from Guwahati, Kolkata and Delhi. Guwahati is also connected to cities like Delhi, Bangalore and Kolkata by regular trains. From Guwahati you can get trains, buses and taxis to most places in the north-east. I, Dr Sunil Deepak, the author of these articles, came to live in Guwahati in December 2014. I am a doctor and I work for the North-East regional office of an Indian NGO (non-governmental organisation) called Mobility India. I am based in Guwahati. My job gives me opportunities to visit different states of the north-east. I am interested in nature, environment, history, art, and literature. I like to write and I am passionate about photography. Since there is little information about places to visit in the north-east, I have created this page (June 2015) and the related articles. Over the next few years I will add more articles to this list.